The tyres-guru.co.uk online store stocks over 100 international tyre brands. 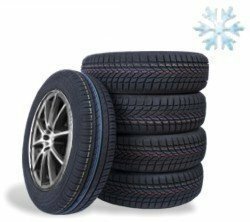 Apart from summer tyres, winter tyres, and all-weather tyres, we also bring you alloy wheels and steel wheels for your car. If you are looking for complete wheels for your car, SUV, vans, or trucks, we have you covered. Check out our quality alloy wheels with winter tyres that have been approved for safe winter use, for example. Thanks to the snowflake symbol, these wheels perform extremely well on icy and snowy roads – even better than all-season tyres. If you are looking for the right rim protection to go with your complete wheels, we are here to offer you just that as well. We want to make it easy for you to choose your perfect alloy wheels and winter tyres. That is why we offer our handy vehicle selection feature. Just share the required details about your vehicle with us so that we can suggest the right tyre size and profile. If you would like, we will even connect you with an expert fitting station near you for a professional tyre change. Of course, free delivery to a mainland UK address is also offered here. If you have any further questions about these tyres and alloy wheels, do not hesitate to contact us.